Photo by Senior Airman Joshua Strang, U.S. Air Force (from Wikipedia). 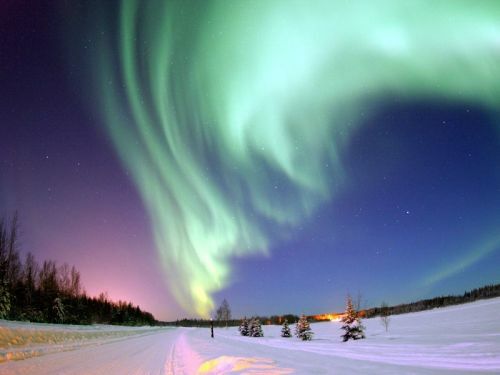 The aurora borealis, or northern lights, shines above Bear Lake on Eielson Air Force Base, Alaska. The term is unfamiliar to most people because it came into use only during the last years of the twentieth century. Before the middle of the nineteenth century the only space weather effects anyone would have noticed were the auroras (northern lights and southern lights), and until early in the twentieth century scientists, like other people, could only speculate about what causes them. In the sixteenth and early seventeenth centuries, natural philosophers (we call them scientists today) thought the lights were from something like polar volcanoes or were optical phenomena akin to rainbows or halos. The first step toward today’s understanding came in 1716, when the English astronomer Edmund Halley related northern lights he saw from London to earth’s magnetic field. Other observations within a few years confirmed this. But this is only part of the story and, by itself, doesn’t connect auroras to the sun. In 1733, Jean Jacques de Mairan proposed that interactions between the atmospheres of the earth and sun cause auroras, and in 1779, Benjamin Franklin (then the world’s leading expert on electricity) suggested that aurora were electrical discharges. While both ideas are correct, they were far ahead of their times. Chapter 7 of The AMS Weather Book tells how the nineteenth-century invention of the telegraph made weather forecasting possible. The telegraph also helped lead to the discovery of the links between the sun and the earth that went beyond the sun being the earth’s primary energy source. Telegraph operators in the 1840s begin noticing strange electrical currents in the wires that connected their offices. Sometimes these currents even caused fires. A few scientists and telegraph engineers begin to realize that the strange electrical currents in telegraph lines seemed somehow related to auroras—they often occurred at the same times—and even to the sun. The British astronomer Richard Carrington provided strong evidence for such links when he reported having seen what we now call a solar flare on September 1, 1859. No one had ever before reported such a thing. For his ongoing sunspot studies Carrington projected his telescope’s solar image on paper on a table. He was sketching locations of several sunspots on the paper, including one very large group, when “… two patches of intensely bright and white light broke out …” around the large group. Another British sun watcher, Richard Hodgson, who was conducting similar sunspot studies at the time, had also seen the flare, which lasted about five minutes. Eighteen hours later, magnetic field instruments at the Kew Observatory in London began recording one of the strongest geomagnetic storms ever seen. It lasted about a week, during which unusual electrical currents coursed through telegraph lines around the world. Unusually bright auroras lit the skies of both hemispheres, even in the tropics. Kelvin’s skepticism is easy to understand. All that scientists at the time had to go on was that signs of solar activity, such as flares, seemed to occur before auroras and geomagnetic storms. The fact that a phenomenon often occurs before a distant phenomenon is not proof that they are linked. A large number of such reports, however, is a sign that further investigation is justified. Further observations could lead to a hypothesis on how the phenomena are linked. One of the major results of Kelvin’s rejection of solar influences on geomagnetic storms and auroras was to slow global acceptance of the pioneering work of Norwegian scientist Kristian Olaf Birkeland, who used observations, laboratory experiments, and various hypotheses in the early years of the twentieth century to develop a theory explaining how solar activity causes auroras. Many European scientists accepted Birkeland’s concepts, but even after Lord Kelvin died, in 1907, his thinking held sway in the British Royal Society, the world’s most important scientific organization of the time. The Royal Society’s disdain meant that English-language scientific journals generally ignored Birkeland’s work. All in all, it makes a good story, which the British writer Lucy Jago tells in her book with a somewhat overwrought but accurate title: The Northern Lights: How One Man Sacrificed Love, Happiness and Sanity to Solve the Mystery of the Aurora Borealis (New York: Knopf, 2001). Observations from space in the twentieth century finally confirmed, in general, Birkeland’s hypothesis of how solar activity causes auroras. Norway honors Birkeland on the 200 kroner bank note with his portrait and a stylized aurora. The development of radio in the early twentieth century also helped lead to further studies of connections between the sun and the earth. In 1901, when Guglielmo Marconi (inventor of radio) sent a signal across the Atlantic, he realized it had to be bouncing off some part of the atmosphere to travel so far. The region is the ionosphere, more than 30 or 40 miles up, where solar radiation has created a layer of ions, which are electrically charged, sub-microscopic particles. Since solar energy creates this region, solar activity changes its characteristics. By the time of World War I, radio operators were beginning to note transmission problems that seemed to be linked to solar activity, especially with certain radio wave frequencies. During the years between World War I and World War II, radio engineers plotted graphs relating sunspots to the strengths of trans-Atlantic radio signals. It was no surprise that, when satellite launches began, space scientists and engineers found things they didn’t understand going on in outer space. In fact, one of the major drivers of space weather research, observations, and forecasting is to avoid as many space weather–caused satellite failures as possible.